Like Jim Cramer and many other investment analysts, I favor the "BRIC" countries (Brazil, Russia, India, China), but as a stampselector, my take on them is somewhat different. Certainly an investor should endeavor to profit from the economic growth of these countries by investing in mutual funds or by prudently picking stocks, but should he be familiar with stamps, then why not diversify into them as well? 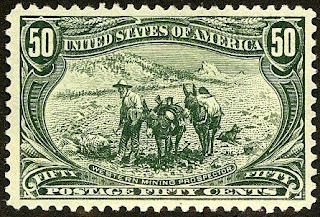 After all, unlike a publicly traded company, a stamp (or in this case, a souvenir sheet) can't be nationalized, lose its value due to mismanagement, fraud, dilution, or competition, or go bankrupt. In fact, a stamp's supply must either remain static or diminish over time, so in effect, all are subject to "stock buybacks" by the Fates or Father Time. 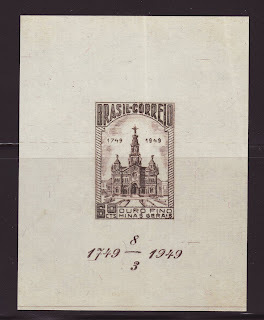 In 1949, Brazil issued a souvenir sheet picturing the Church of Sao Francisco de Paula, and commemorating the Bicentenary of the city of Ouro Fino (Scott #687a). Only 10,000 were issued, and Scott '10 values this religion topical at $62.50 for unused and $30.00 for used. As an added "bonus feature," the s/s was issued without gum, making preservation less of a headache. The '49 Church souvenir sheet is, in my opinion, grossly undervalued, and a likely candidate for hoarding and price manipulation in the not-too-distant future. There are a number of undervalued Brazilian issues with printing quantities of 10,000 to 100,000, some of which have topical appeal, and recommending them for accumulation seems a no-brainer. Brazil looks destined to become an economic superpower, and even if it mirrors the philatelically anemic U.S. and only one out of a thousand Brazilians become serious stamp collectors and one out of a fifty become "non-serious" ones, they'll be competing for their nation's better stamps, only to find that the cupboard is bare. Note: I've never seen a First Day Cover of #687a, and it's possible that they are rare, because the sheet was issued without gum. I have recently published a buy list for stamps and souvenir sheets of Brazil, including this issue. Viewing dealers' buy lists is an excellent way to keep abreast of the stamp market. Those interested in learning more about investing in stamps are welcome to join the Facebook "Stampselectors" group. The group currently has over 1,600 members who engage in trading and lively discussion about the stamp market and practical issues related to stamp collecting. I'm sceptical about Brazil and India as growing markets for stamps. Chinese people, I find, are very often interested in stamps - by contrast, I haven't met a single Brazilian or Indian who is. 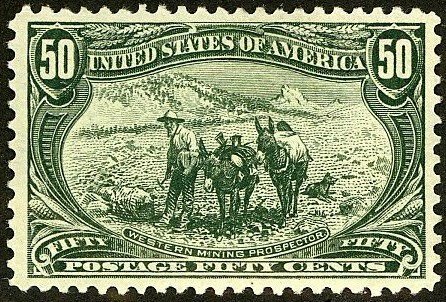 There's more to stamp collecting than a rising middle class. There's a certain attitude towards the pat, a kind of antiquarian sensibility. This attitude can be found among many middle class Chinese, but not, from my experience, among Brazilians or Indians. I agree that cultural factors play a part in determining whether people who are members of certain ethnic groups/nationalities collect stamps more than others. Unfortunately, it's a very difficult factor to gauge or quantify, and it's also dynamic. It's impossible to predict what will happen when when a country with no significant middle class suddenly gets one, because people tend to think and act differently when they acquire disposable income.